Sooner: landing where the turkey is. In between: mixing your own cocktails at 30,000 feet. 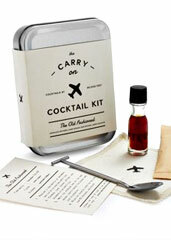 Make sure your seat is in the full upright position for the Carry On Cocktail Kit, a little tin case that magically transforms a bottle of airline liquor into a real-deal Old Fashioned, now available online and at the Boston Shaker. So you’d like to kick back with a well-made drink in hand and contemplate how tiny everything looks down there. The obvious way to make that happen is to fix a cocktail at home and walk it through security. —Two packets of unrefined demerara sugar. —A miniature stainless-steel bar spoon/muddler. —A recipe card in case you forgot to bring reading material. Just add alcohol, and (magical sound effect)... Old Fashioneds for two.